The flavors and textures of homemade granola are superior to any store-bought brand. 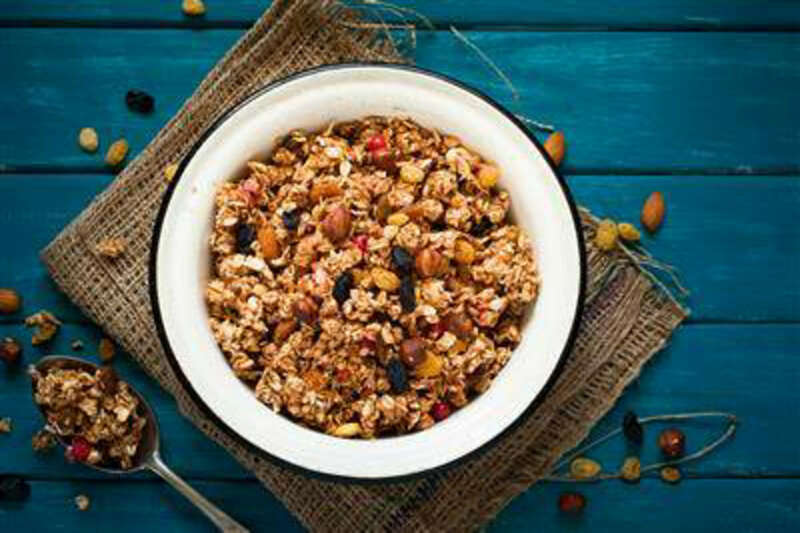 This recipe is virtually bursting with flavor from oats, nuts, flax seed, dried fruit, and a kiss of honey and sweet spices. It gets a colorful cheer from the dried blueberries. Your recipient can eat it as a snack, or for topping yogurt or ice cream. RecipeSavants.com The flavors and textures of homemade granola are superior to any store-bought brand. This recipe is virtually bursting with flavor from oats, nuts, flax seed, dried fruit, and a kiss of honey and sweet spices. It gets a colorful cheer from the dried blueberries. Your recipient can eat it as a snack, or for topping yogurt or ice cream. Smart Recipes, American Recipes, Vegetables Recipes, Recipes Vegetables American Berry Delicious Granola PT40M Serves 12 Ingredients: 2.25 Pounds Rolled Oats 1.5 Cups Coconut Oil 0.5 Teaspoon Salt 0.5 Cup Honey 0.5 Cup Maple Syrup 1 Cup Almond Meal 1.5 Cups Flax Seed Meal 1 Cup Chia Seeds 1 Cup Raw Sesame Seeds 1 Cup Raw Sunflower Seeds 1 Cup Raw Pumpkin Seeds 1 Cup Almonds 0.5 Cup Walnut Pieces 1 Cup Unsweetened Grated Coconut 1 Tablespoon Cinnamon 1 Cup Dried Blueberries 1 Cup Dried Cranberries 1 Cup Golden Raisins Preheat the oven to 300 degrees. Mix together oats, coconut oil, salt, honey and maple syrup in a bowl, slowly stir in the remaining ingredients until thoroughly combined. Transfer this mixture to a lightly greased cookie sheet and bake for 30 minutes. Stir the granola every 10 minutes. Allow to cool and transfer to the airtight storage containers.